Stabilizing and repairing structural damage usually involves hiring a contractor experienced in working on old buildings. Due to the risks, jacking and reinforcing a structure should be done by those with experience and proper tools. 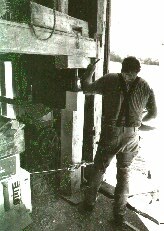 Local sawmills are usually the best source for custom-sawn timbers. Sometimes new steel cables or cross beams may prevent walls from splaying out and allow continued use of a barn. Often new wood may be "sistered" (joined) onto the side of deteriorated or broken timbers to reinforce them, avoiding replacement of structural members, such as sills, plates, or joists. Epoxy consolidants and fillers can sometimes be used to repair damaged wood that is not subject to structural stress.